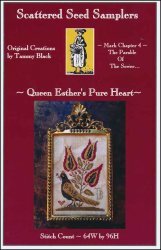 Queen Esther's Pure Heart [C7051] - $12.00 : Yarn Tree, Your wholesale source for cross stitch supplies. A cross stitch design from Scattered Seed Samplers. This little sampler is in honor of Queen Esther from the Bible. She's wearing a little crown on her head and tulips are blooming behind her. Stitch count 64w x 96h.